At least 2 boxes of shells per day you hunt I would recommend unless you shoot a gun with an ext tube. I shoot 12 ga 3-½ BBB with a pattern master choke tube which is lethal. I would recommend shooting 12 ga 3in or 3-½ however between the sizes of steel 1 or 2s to BB, BBB, or even T’s. Whatever you like to shoot its your choice just be sure its non-toxic boys. I would definitely bring some thing so that you are able to clean out your shotgun after each days hunt. 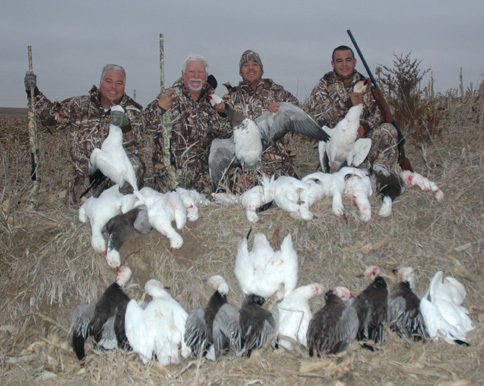 The wind and dirt gets inside the gun and the next time a flock of snows comes in feet down your gun jams.. Its not a good feeling and we clean our shotguns regularly to avoid catastrophe like that. Camo warm waterproof clothes, gloves, facemask, and boots is absolutely critical, it could be 50 degrees or it could be 10 degrees. It can get extremely muddy at times so prepare accordingly for that because normally the mud isn’t good if you’ re not prepared for it. At times waders is the easiest however you will not need them necessarily depending on the amount of mud. Being able to take your waders off and be clean underneath can be the best way to go. You may want to bring some food and snacks to the field with you its your choice. Normally we do not leave the field for lunch however it is your choice to go grab some food or stay. Bringing a camera is a great idea also, we want you to take back plenty of pictures of your hunt however if for some reason you forget one we can send you the pictures. We also recommend you get your license online to avoid any hassles morning of the hunt, get your license ahead of time. You will need a cooler to keep the birds from spoiling. All harvested birds will be divided among the clients for the day. You are responsible for cleaning them.